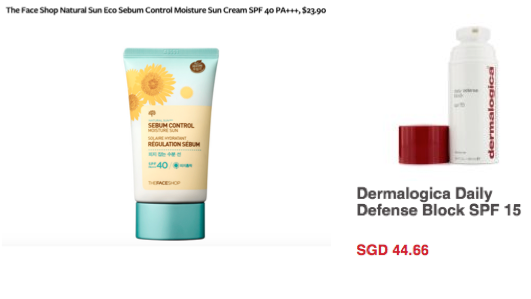 SG Budget Babe: Are You Sure There's Such A Thing As $5 Organic Sunscreens? Are You Sure There's Such A Thing As $5 Organic Sunscreens? You already know why I'm blogging about this - it is not everyday you see $5 organic sunscreens on sale! I'm a little late to the party, but it was only a few years ago when I discovered how essential sunscreen is. I used to neglect sun protection despite Singapore's sunny climate, but I guess I got a rude wake up call when I hit my 21st birthday as an "adult". Suddenly, friends and cousins were telling me that I was no longer young, to which I would often reply by saying, "You hardly look a day over 21 yourself!". When sharing their skincare secrets to looking good (and filtering out the "expensive" advice they were giving, such as regular maintenance through facials), one commonality kept popping up. After all, sun protection is highly touted as the secret to looking youthful by many gorgeous Hollywood celebrities. Halle Berry swears by DDF organic sunscreen as a "must" (although the product was later discontinued...i wonder if it had anything to do with the fact that consumers were expressing doubts about their organic content? ); the fabulous Jennifer Lopez wears nothing less than SPF 15 daily, while Kate Moss believes SPF 50 is essential for her skin. The problem is, as some of you might already know by now, I don't have good skin to begin with. My skin is extremely prone to acne breakouts. In fact, after finishing a recent dance performance 2 weeks ago, I broke out in 5 zits from all that thick stage makeup! Gross! I tried the expensive La Roche-Posay Anthelios XL Ultra-Light Fluid, which was touted to be great for sensitive and acne-prone skin, but it only broke me out further. 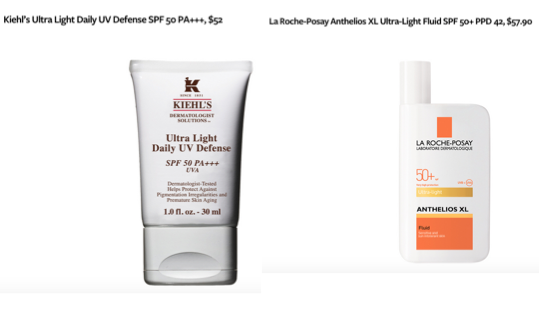 After trying numerous brands, I came to realize the hard way that most sunscreen tend to clog my pores (especially cream-based ones) so I had no chance but to avoid them for the most part of my teenage life. Given a choice between having pimples and tanned skin, I rather choose the latter. The biggest pet peeve I have about most commercial sunscreens is that they're often made from chemicals. Where there has been no compelling evidence suggesting that the chemical ingredients titanium dioxide or zinc oxide are harmful in the long run, I prefer to err on the safe side of caution and go with something more natural. However, finding an organic sunscreen is almost next to impossible in Singapore! So I had no choice but to use chemical sunscreens for the beaches. 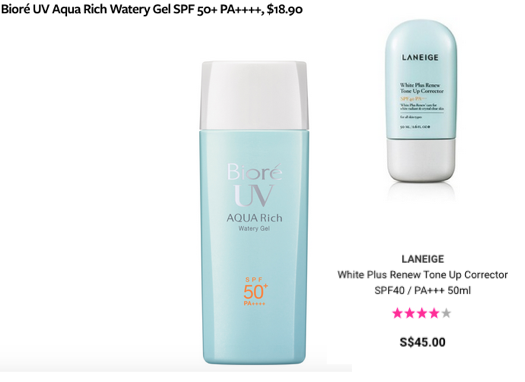 Biore's newest gel sunscreen initially served me well when I was at Langkawi earlier this year, but on the third day I started breaking out again despite masking regularly in my hostel room. Thus, I officially gave up. Then Irene launched her cream sunscreen which had rave reviews especially from those who had dry skin, but I refused to try it as I was worried it would break me out like the others. It doesn't matter that she's my business partner - my skin is my utmost priority! Apparently, a few other consumers had the same concerns, so together with the feedback they received, the Blended team worked hard to curate a gel moisturizer instead. Last month, the gel version of this was finally ready and when I read the ingredient list, it sounded almost perfect for me! Made from a pure aloe vera gel-base with Vitamin E, jojoba and boasting a SPF protection of 25, it was a 2-in-1 product as a sunscreen AND a moisturizer. I tried using it as a makeup base and it really smoothened my skin, leading my foundation to glide on smoothly. The only downside was that I needed to wait 30 seconds before applying my makeup for the mixture to be absorbed. The folks at Shopee have kindly partnered with Blended to run another great offer! 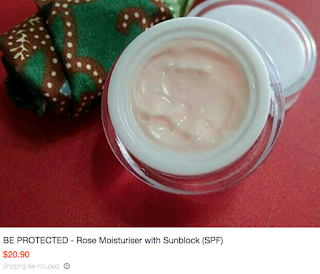 Irene has kindly offered to absorb $5.90 while Shopee pays for $10 of the product retail price - which means the gel sunscreen is now available for only...$5! I've been using this for a little over a month now, and I swear it works fabulously on my skin. The other day, I was under the sun for over 2 hours, but while my body turned a shade tanner (despite using Vaseline's sunblock), my face remained the same. There's still 1/3 remaining in my pot, so I daresay it lasts quite long despite daily usage, given that I only need a tiny pinch to slather over my entire face. Incredible. If you've been having a love-hate relationship with chemical sunscreens like me, check out this organic version by Blended here, especially now that Shopee is sponsoring $10 for the next 4 days. The original retail price is $20.90, so getting a 76% discount is seriously huge savings. P.S. Anything higher than SPF 50 is apparently misleading, according to the FDA, so do bear that in mind when you go shopping as well! This post is brought to you on behalf of Blended. 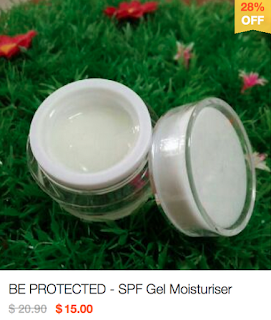 a SPF product without TiO2 or ZnO or any chemical sunscreen agents? That sounds amazing if true but I'm not too convinced. Do you have the ingredient list? Thanks!